Scales are one of the most picky tools you’ll ever use at home. They want a level surface. They need a firm surface. They even need you to be perfectly balanced in order to deliver a solid result! Although scales have been around for years, only recently have the most accurate scales become available for home use. When you have a medical scale quality with the most accurate home scale to use every day, it simply becomes easier to maintain your weight. Why Is Owning the Most Accurate Scale Necessary? Here’s a fun fact that most scale manufacturers don’t want you to know: it is considered “normal” for a digital scale to have at least a 1% variation. Doesn’t seem like much, right? Let’s take an average guy who weighs 200 pounds as an example. With a 1% variation, the manufacturer will consider it normal for the scale to read 198 pounds or 202 pounds. That’s a 4-pound difference! To make sure you’re getting precise weights, you’ll need an accurate scale that does better than this normal variance. You’ll need something that provides more than just an estimate! That’s why looking at scales which are used in medical offices is a good place to get started if you’re concerned about accuracy. Doctors need accurate readings to track health and so they have done a lot of the research already to find the best brands and the best scales. Accurate readings, even if they are only 5 pounds off, are also something that can discourage a person who is trying to lose weight. Imagine this 200-pound fellow has worked hard to lose 20 pounds already. Now he steps onto the scale and sees that he “gained” two pounds when he actually might have lost two pounds. He feels discouraged, ends up having a bad eating week, and gains two actual pounds… but the scale says “206” now. He becomes even more discouraged and gives up on his diet. With so many sources of error in a digital scale, accurate data, problems like this are proactively prevented. That’s why owning one is so important. What Are the Different Kinds of Accurate Scales? The best accurate scales can actually be made in several different ways. Balance beam scales. These are the scales that you run weights across a balance beam as you stand on the scale. They have been used for generations because of their reliability and are pretty simple to use. A small screw or adjustment level is used to make sure that the scale is at a true zero. Digital scales. Many of today’s digital scales are very accurate as well, especially with their automatic calibration features. Make sure to place them on a very firm surface and look for platforms that have a non-slip finish for a safe weighing experience. Handheld scales. Sometimes it is a measurement of body composition that is needed instead of an actual weight. There are a number of good handheld sensor units that will help track your pulse, your body fat content, and other specific data that you might want. Combination scales. There are also several scales that combine two or all three of these unique styles together to meet very specific needs that a household may have. Most households are going to love the affordability of a digital scale, but some households may wish to invest in a balance beam scale because it provides an unparalleled level of accuracy. With the key features and advantages that you’ll find in every review, today is the day to get started with the research that is required to find the best and most accurate scale that will meet your needs. What Features Do the Most Accurate Scales Have? A medical scale can look like many different things today. It could be a balance beam scale or it could be a digital scale. What both of these types of scales have in common, however, are some specific features that will let you know that you’re getting the most value for your investment. Calibration is the most important feature to consider. Whether you just step on and then step off of a digital scale to calibrate it or you’re manually turning a screwdriver to do it, accuracy cannot be achieved until you reach a true zero reading. It’s important to make sure that your scale is correctly zeroed each time you use it. Being perfectly positioned on the scale is also important for a good reading to be obtained. Many people actually lean a little in one direction naturally and this can actually skew the weight measurement on the modern scale. The best scales will have alerts set up to let you know if you’ve got too much leaning in your posture so that it can be corrected to receive an accurate weight. Some scales will also register an imbalance in the pressure that you’re placing on the scale. It could be because you’re standing in the center of the scale or maybe you’ve got a foot that is partially off of the side of it. Either way, you’ll receive an indicator to fix your balance before you receive the weight measurement. What Are the Prices of Accurate Scales Today? A medical scale is not a cheap item to purchase. The best scales in this category class are going to be around $250, but in return you’ll get a lifetime of use out them in most circumstances. They’ll have calibration options as well to make sure you’ve got complete accuracy. Entry-level models in this niche tend to run around $30. They are automatically calibrated and may offer additional body composition measurements or estimates depending on the brand. A high quality scale that is very accurate and has a fair amount of features that provide added value will generally cost around $60. There’s a lot of good stuff going on with the Weight Gurus scale. It’s not just the mechanisms that make it one of the most accurate scales around. It’s also the fact that you can use the measurements from this scale to chart trends on the included smartphone app! The 4.4 inch LCD is incredibly easy to read thanks to the bright backlighting and light blue tones and there are 4 strain gauge sensors that will provide an accurate result on this low profile tool. We really love the fact that there’s a 5 year warranty that comes with this scale, as well as a 100% satisfaction guarantee! If you need accuracy and affordability today, then this might just be the most accurate scale for you. A large white LCD display of 3.5 inches makes reading the received results a simple process in virtually any lighting condition and it measures in pounds or kilograms and has 4 high precision sensors help to verify the reliability of every weigh in. 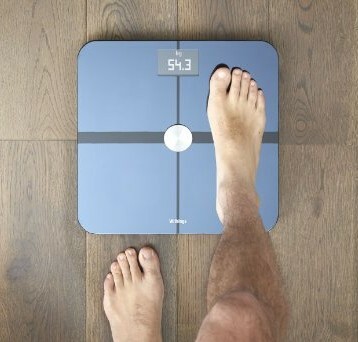 You’ll also be able to track how much weight has been gained or lost since the first weigh in of each person that has been programmed into the scale. It works consistently and does what it is asked to do and that’s why we recommend it today. The most unique aspect of this Weight Watchers scale is its proprietary levelling technology that is built into the display. It is pretty easy to fool a digital scale into giving you an inaccurate result by not distributing your weight properly. There is a leveller indicator will show you if your balance is off-center and if it is, which direction you need to shift your weight. Once you receive a diamond indicator of balance, you’ll receive your weight reading! Are you tired of using digital scales that make you doubt what the results will be? With the Seca 700, you’ll be receiving a scale that will measure up to 500 pounds accurately using the traditional method of balancing. Slide the weights over the measurement indicators to make the scale balance out and you’ll have your weight! It offers precision increments of 1/10 of a pound so that you can track even the smallest improvements in your weight and BMI percentage. It’s easily one of the most accurate scales available today and receives our highest recommendation. Many doctor’s offices have transitioned to two-piece scales because they provide a more accurate, digital result. This scale provides a 12×12 inch platform with a non-slip mat just like you’ll find at most medical offices. It has a 0.5 inch readout that comes with the scale platform and it can easily be mounted on a wall, a desk, or even be connected to a serial port if you prefer. Made from heavy duty steel, this is one solid scale and an optional carrying case can be included with your purchase as well. Do you want a product that is proven to be dependable, yet still affordable enough that you won’t need to make sacrifices in other areas to purchase the item? The Omron HBF-514C is a full body composition monitor that is designed to measure your key fitness tracking items at home with ease. It’s about the cost of a dinner out with the family on Amazon and in return, you’ll get the data you need to meet your next fitness goal. It has the ability to measure weights up to 330 pounds in addition to the various other measurements that it can take and is incredibly easy to setup and use so that you can start getting results that you need in just minutes. If you want a balance beam scale that isn’t going to cost you an arm and a leg, then this is the scale that you’ll want. It has a 400 pound capacity and is incredibly easy to set up virtually anywhere there is a level floor. Because of the raised steel platform, this scale will also work on a wider variety of floors, although a level surface is required. 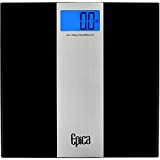 It’s made in the USA, includes a height rod if you wish to do a BMI calculation independently, and its design makes it one of the most accurate scales available right now at this price point. Do you want something that will provide an extra wide platform, but still look good in the bathroom? The EatSmart Precision Plus is a digital scale that you’ll want to consider to solve these problems. It’s over 15 inches wide, which is at least 3 inches more than other scales at this price point. The platform is made from an aluminum base and the top has a plastic cover with non-slip features to keep you safe and a two year warranty is included with this product so there is consumer protection against defects. If you’re looking for the most accurate scale possible for your home, then you will want to consider this offering by EatSmart near the top of the list. With this scale, it is all about the design of the platform. The top of the platform, which is made from a combination of high-grade plastic and aluminum, has been finished with a non-slip surface that makes stepping onto the scale safe and easy. The 12×12 platform is big enough for most folks and the low profile; slim design makes it easy to step onto it, even with feet that are wet or issues with knees or other joints. Even though it doesn’t have the tempered glass design of other scales, there is still a 2 year warranty against product defect with this EatSmart premium version. This means you’ll get a lightweight scale that will still meet your needs while being light enough for anyone in the family to be able to move or use based on their needs. It has automatic calibration features so you don’t ever have to worry about setting the scale back to a true zero and will provide you with instant readings. Just step onto the scale and get an accurate reading! The most accurate scale will provide you with all of the data you need to achieve whatever goal you may have concerning your weight or body composition. Use the comprehensive reviews that are available here to get the information you need to make an empowered decision and you’ll have no regrets with your purchase of a scale today. Why? Because you’ll have confidence in knowing you got the best possible tool for your home.